You're looking at Korea's answer to the Golf GTI; a 201bhp hot hatch that hopes to take the fight straight to the sporty small car segment. The 1.6 litre engine has been given the turbo treatment that hikes power up by a much as 75bhp over the standard, un-blown model. The increased muscle under the bonnet doesn't quite compete with the likes of the Vauxhall Astra VXR (276bhp) and the brilliant Ford Focus ST (247bhp) but the styling tweaks certainly make this look like machine that means business. Distinctive quad LED lights are nestled into a much meatier front bumper that grazes that asphalt, bespoke 18-inch alloys fill the flared wheel arches and a distinctly Golf GTI-esque honeycomb mesh grille tops off the new aggressive front end. 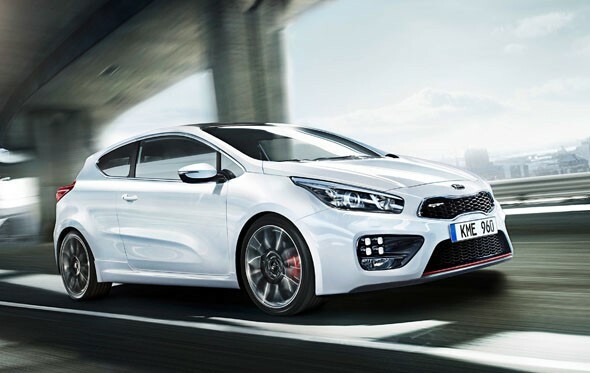 The images don't reveal the rear but Kia has said the back end is just as pretty, with twin-exit exhausts ramming home the performance intentions of the new model. Inside, the car gets Recaro race seats and red stitching that flows from door panels to the leather-wrapped steering wheel. Expect the 0-60mph sprint time to be around the 8 second mark while the chassis and suspension set-up to be firmer to provide a much more involved driving experience. The pro_cee'd GT will be officially unveiled at the Geneva motor show in March but the model is likely to go on sale late summer and cost around £22,000.